Click on a line to jump to the post. Will open in a new tab. Thinking up mnemonics (memory devices or tricks) is second only to look/cover/write/check as a popular spelling strategy. Sometimes they are very useful, sometimes they are innocuous and sometimes they are unhelpful to the point of damaging a student's ability to spell other words. This post starts a series on how to evaluate mnemonics, what role students can have in creating them, and what are the alternatives. Let's step outside the world of spelling for this introduction. 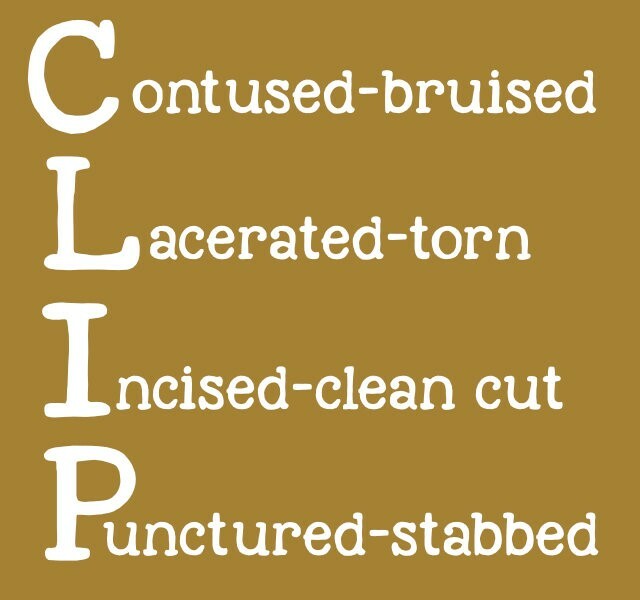 CLIP is helpful because we were trying to learn four terms, three of which were completely new to 10-year-olds. It's also helpful that 'contused' and 'bruised' rhyme and the whole thing can be said in a rhythm. 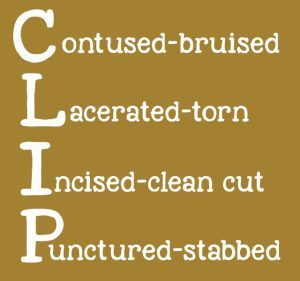 In fact, I can chant those four details without ever having to think of CLIP first because they are filed in my brain under 'things I just know'. If I ever had to describe a wound over the phone, I might go through contused/bruised, lacerated/torn first to find the word 'incision', but I would get there. That's how mnemonics work. 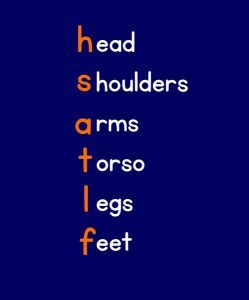 Medical students have heads full of them. Here's something we didn't learn to remember parts of the body. We already knew where our heads were in relation to our feet and all parts in between - even though we may not have thought about it 'in order'. We already knew all those words except perhaps 'torso'. Learning that sentence would have created an additional and unnecessary load on our memories. We would have been remembering 6 words then attaching 6 other words when what we really needed to remember was 'torso' - the tricky bit. In a situation where you need to think quickly (a first aid emergency or writing fluently) the last thing you need is to be processing a completely unnecessary layer of information. No one needs to recite, 'He says all teens lack finesse', to remember that their feet come after their legs - just like no one needs to say, 'George Eliot’s Old Grandpa Rode A Pig Home Yesterday', to spell 'geography'. That's what we'll discuss in this series on spelling mnemonics. Poor little Susie dropped dead in Upper Canada. 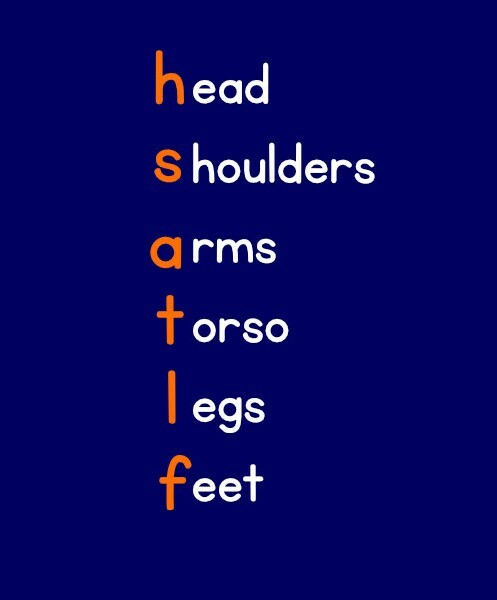 That's another mnemonic we learned in first aid and I have no idea what it stands for. The internet doesn't seem to know either, so if you know, please share and put me out of my memory misery. Thanks! Note that all the spelling mnemonics I'm citing are ones I've found in several places on the internet. They don't appear to be the work of any one person. If you think it's your idea, let me know. If it happens to be one I think is a bad idea, I'm not trying to offend well-meaning teachers. I appreciate you! I do, however, want everyone to be thinking about where spelling mnemonics lead: are they breaking down barriers to good spelling or creating barriers to good spelling?